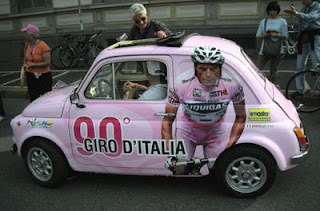 At last year's Giro. Danilo Di Luca's cool pink Fiat 500! Last weekend I ventured out to Fritz's Italian bike, motorcycle and car show in North Vancouver. 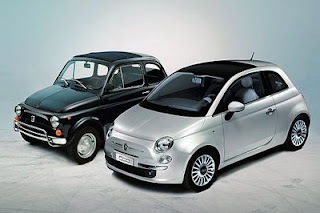 And, one car that got my interest was the Fiat 500. This little Italian car was popular and production was from 1957-1975. Economy was the issue as it was modeled after the the rear engine mounted Volkswagen Beetle. The early model sported a 499cc engine with an astounding 50 mpg. It proved very popular and was embraced throughout Europe. 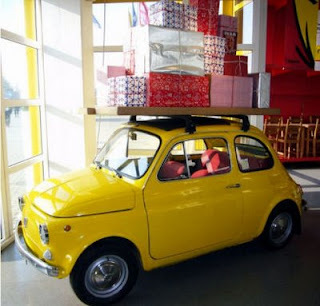 Everyone remembers the Ikea car. Nice cargo rack! Before and after, the looks are wonderful. The new model reintroduced but unfortunately only in Europe.